This comes as a surprise because the diode has a repetitive peak reverse voltage rating of 50 volts, which the technician knows is greater than the peak voltage output by the step-down transformer. However, the technician has overlooked something very important in this circuit design. Explain what the problem is, and how to solve it. The diode's peak inverse voltage ("PIV") rating is insufficient. It needs to be about 85 volts or greater in order to withstand the demands of this circuit. Follow-up question: suggest a part number for a diode capable of withstanding the reverse voltage generated by this circuit, and able to handle at least 1 amp of continuous current. If students experience difficulty calculating the necessary PIV rating for this circuit's diode, ask them to analyze the peak output from the transformer's secondary winding for each half-cycle of the AC waveform, noting the voltage drops across all circuit components. Once a full-cycle voltage analysis is performed for all circuit components, the necessary diode rating should become obvious. Though it may not be obvious at first reading, this question may actually serve as a lead-in for discussing voltage multiplier circuits. The fact that the diode experiences a reverse voltage twice that of the peak AC voltage is something we may exploit! Another reliability factor most students won't recognize in this circuit is the ïnrush" current experienced by the diode every time the circuit is powered up and the capacitor recharges. Certainly, the diode was not properly rated for the reverse voltage it was being subjected to, but this might not be the only form of abuse! If time permits, discuss this possibility as well. Determine the degree of voltage multiplication (double, triple, etc.) provided by each circuit. Ask your students how they analyzed each of these voltage multiplier circuits, and to explain their technique(s) to the rest of the class during discussion. 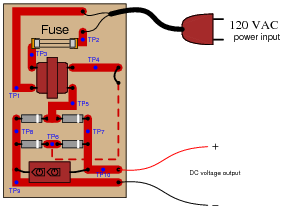 AC-DC power supply circuits are one of the most common circuit configurations in electronic systems. Though designs may vary, the task of converting AC power to DC power is vital in the functioning of a great many electronic devices. Why is this? What is it about this kind of circuit that makes it such a necessary part of many electronic systems? Most electric power distribution systems are AC, yet most electronic circuits function on DC power. One factor not mentioned in the answer is circuit operating voltage. How do the operating voltages of a typical AC power system and a typical electronic circuit (radio, alarm clock, computer) compare? Ask your students what purpose a power supply has with regard to voltage. Ask your students if the word ßupply" is truly appropriate for this type of circuit. Does it really supply energy, or does it just convert energy from one form into another? However, this form of AC-to-DC power conversion has some significant limits. Explain why most power supply circuits utilize a transformer instead of directly rectifying the line power as this circuit does. Transformers provide voltage/current ratio transformation, and also electrical isolation between the AC line circuit and the DC circuit. The issue of isolation is a safety concern, as neither of the output conductors in a non-isolated (direct) rectifier circuit is at the same potential as either of the line conductors. Follow-up question: explain in detail how the issue of non-isolation could create a safety hazard if this rectifier circuit were energized by an earth-grounded AC line circuit. Many old television sets used such transformerless rectifier circuits to save money, but this meant the metal circuit chassis inside the plastic cover was energized rather than being at ground potential! Very dangerous for technicians to work on. 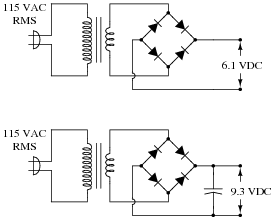 Draw the respective output voltage waveforms of these two power supply circuits (Vunfiltered versus Vfiltered). 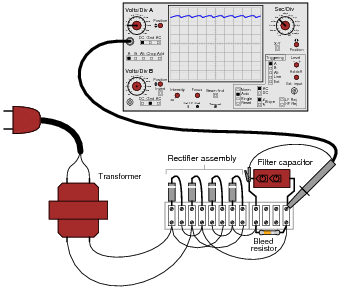 Also identify the type of filter circuit needed for the task (low pass, high pass, band pass, or band stop), and explain why that type of filter circuit is needed. A low pass filter is the kind needed to filter "ripple voltage" from the power supply output. Many years ago, when I was first learning about power supplies, I tried to power an automotive radio with voltage from a battery charger. The battery charger was a simple power supply suitable for charging 12-volt automotive batteries, I reasoned, so what harm would there be in using it to power an automotive radio? After a few moments of LOUD humming from the radio speaker, my rhetorical question was answered by a puff of smoke from the radio, then silence. Part of the problem was the output voltage of the battery charger, but a large part of the problem was the fact that the charger's output was unfiltered as well. For the same reasons my radio did not function properly on unfiltered, rectified AC, many electronic circuits will not function on it either. If both of these waveforms were measured on the same power supply circuit, at different times, determine which waveform was measured during a period of heavier "loading" (a "heavier" load being defined as a load drawing greater current). The left-hand waveform was measured during a period of heavier loading. Ask your students what the term "loading" means in this context. Some of them may not comprehend the term accurately, and so it is good to review just to make sure. More importantly, discuss with your students why the ripple is more severe under conditions of heavy loading. What, exactly, is happening in the circuit to produce this kind of waveform? If it is necessary for us to maintain a low amount of ripple under this heavy loading, what must we change in the power supply circuit? What does it mean if a power supply has a DC output with 5% ripple? This means the peak-to-peak ripple voltage is equal to 5% of the DC (average) voltage. The purpose of this question is to get students to look up the formula for calculating ripple voltage percentage. Notice how I did not simply ask them to regurgitate a formula; rather, I presented a realistic figure for them to interpret. When at all possible, try to format your questions in this sort of practical context! What parameters determine the frequency of a power supply's ripple voltage? For linear power supplies (those designs having a transformer-rectifier-filter topology), the parameters determining ripple frequency are line frequency and rectification pulses. Note that I did not simply say the ripple frequency is equal to line frequency for half-wave rectification and double the line frequency for full-wave. Such an answer is misleading, since it completely ignores polyphase AC rectification! Suppose a power supply is energized by an AC source of 119 V RMS. The transformer step-down ratio is 8:1, it uses a full-wave bridge rectifier circuit with silicon diodes, and the filter is nothing but a single electrolytic capacitor. Calculate the unloaded DC output voltage for this supply (assume 0.7 volts drop across each diode). Also, write an equation solving for DC output voltage (Vout), given all these parameters. Follow-up question: algebraically manipulate this equation to solve for Vin. It is important for students to understand where this equation comes from. Ask your students to explain, step by step, the process of calculating output voltage for a simple power supply circuit. It is helpful in this process to calculate the voltage at each ßtage" of the power supply (transformer primary, transformer secondary, etc. ), as though we were building the circuit one component at a time. Incidentally, the method of building a project (such as a power supply) in a step-by-step fashion rather than all at once, saves a lot of time and effort when things go wrong. The same ßtep-by-step" strategy works well for mathematical analysis, and other problem-solving tasks as well: try to analyze the circuit one "block" at a time instead of the whole thing at once. What does it mean if a power supply exhibits 2% voltage regulation? This means the difference between no-load output voltage and full-load output voltage is 2% of the full-load output voltage. The purpose of this question is to get students to look up the formula for calculating voltage regulation percentage. Notice how I did not simply ask them to regurgitate a formula; rather, I presented a realistic figure for them to interpret. When at all possible, try to format your questions in this sort of practical context! What will be the consequence of one diode failing open in the bridge rectifier of a single-phase power supply? The (unfiltered) output voltage will be half-wave, not full-wave. A question such as this is best discussed while viewing the schematic diagram for a bridge rectifier. I recommend projecting an image of a bridge rectifier circuit on a whiteboard, then having students use dry-erase markers to "mark up" the schematic with arrows for current, voltage drop indications, etc. This way, mistakes can be corrected, or alternate cycles erased and re-drawn, without having to erase and re-draw the schematic diagram itself. Incidentally, the "low voltage AC power supply" is nothing more than a step-down transformer with a center-tapped secondary winding. "Remove all diodes from the circuit and test them individually" is not an acceptable answer to this question. Think of a way that they could be checked while in-circuit (ideally, without having to shut off power to the circuit). A common tendency for students is to troubleshoot using the ßhotgun approach," which is to remove each component one-by-one and test it. This is a very time-intensive and inefficient method of troubleshooting. Instead, students need to develop diagnostic procedures not requiring removal of components from the circuit. At the very least, there should be some way we can narrow the range of possibilities using in-circuit tests prior to removing components. While this design will work, there are better filter configurations for this application. 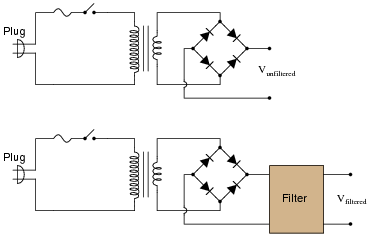 Describe the limitations of the circuit shown, and explain how some of the other filters would do a better job. The resistor R tends to limit the output current, resulting in less-than-optimal voltage regulation (the output voltage ßagging" under load). Better filter configurations include all forms of LC ripple filters, including the popular "pi" (p) filter. Follow-up question: in some applications - especially where very large filter capacitors are used - it is a good idea to place a series resistor before the capacitor. Such a resistor is typically rated at a low value so as to not cause excessive output voltage ßag" under load, but its resistance does serve a practical purpose. Explain what this purpose might be. Challenge your students with this question: is this the right kind of filter circuit (low pass, high pass, band pass, band stop) to be using, anyway? This question presents a good opportunity to review basic filter theory. Assume that the power transformer has a step-down ratio of 9.5:1. Before one can troubleshoot a malfunctioning circuit, one must know what voltages and currents are supposed to be in various portions of the circuit. This question, therefore, is a prelude to further troubleshooting questions. Based on these measurements, what do you suspect has failed in this supply circuit? Explain your answer. Also, critique this technician's troubleshooting technique and make your own suggestions for a more efficient pattern of steps. The fuse is blown open. Follow-up question: with regard to the troubleshooting technique, this technician seems to have started from one end of the circuit and moved incrementally toward the other, checking voltage at almost every point in between. Can you think of a more efficient strategy than to start at one end and work slowly toward the other? Troubleshooting scenarios are always good for stimulating class discussion. Be sure to spend plenty of time in class with your students developing efficient and logical diagnostic procedures, as this will assist them greatly in their careers. The transformer has an open winding. Follow-up question #1: with regard to the troubleshooting technique, this technician seems to have started from one end of the circuit and moved incrementally toward the other, checking voltage at almost every point in between. Can you think of a more efficient strategy than to start at one end and work slowly toward the other? Challenge question: based on the voltage measurements taken, which do you think is the more likely failure, an open primary winding or an open secondary winding? Follow-up question #2: how could you test the two windings of the transformer for a possible open fault? In other words, is there another type of measurement that could verify our hypothesis of a failed winding? Students may be puzzled by the presence of DC voltage between TP7 and TP8, and also between TP9 and TP10 (1.1 volts), given that there is less than that amount of AC voltage at the rectifier's input. However, this is a common phenomenon with electrolytic capacitors, to "recover" a small voltage after having been discharged. There is an öpen" fault between TP4 and TP6. As you can see, the input current waveform lags the voltage waveform by 90o, because when the power supply is unloaded, the only input current is the magnetizing current of the transformer's primary winding. The non-filtered DC output waveform is still shown as a dotted line, for reference purposes. Challenge question: does the input current waveform shown here contain even-numbered harmonics (i.e. 120 Hz, 240 Hz, 360 Hz)? In a filtered DC power supply, the only time current is drawn from the rectifier is when the filter capacitor charges. Thus, the only time you see input current above and beyond the magnetizing current waveform is when the capacitor voltage requires charging. Note that although the (sinusoidal) magnetizing current waveform is 90o out of phase with the voltage waveform, the input current transients are precisely in-phase with the current transients on the transformer's secondary winding. This reviews an important principle of transformers: that whatever primary current is the result of secondary winding load is in-phase with that secondary load current. In this regard, a transformer does not act as a reactive device, but a direct power-coupling device. Note also that after the initial surge (rising pulse edge) of current, the input current waveform follows a different curve from the voltage waveform, because i = C[dv/dt] for a capacitor. In case you haven't guessed by now, there is a lot of stuff happening in this circuit! I would consider this question to be ädvanced" for most introductory-level courses, and may be skipped at your discretion. Determine what type of filter circuit this is (LP, HP, BP, or BS), and also determine the inductive and capacitive reactances of its components at 60 Hz, if the inductors are 100 mH each and the capacitors are 0.022 mF each. Ask your students how they determined the identity of this filter. Are they strictly memorizing filter configurations, or do they have a technique for determining what type of filter circuit it is based on basic electrical principles (reactance of components to different frequencies)? Remind them that rote memorization is a very poor form of learning! Examples of ßplit" or "dual" power supply schematic diagrams abound in textbooks. I'll let you do the research here and present your answer(s) during class discussion! 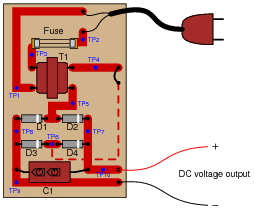 Students need not provide details of voltage regulation, but merely show how AC from a center-tapped transformer winding may be rectified into two distinct DC outputs with a common "ground" connection. Any one diode fails open: Half-wave rectification rather than full-wave, less DC voltage across load, more ripple (AC) voltage across load. Transformer secondary winding fails open: no voltage or current on secondary side of circuit after C1 discharges through load, little current through primary winding. Inductor L1 fails open: no voltage across load, no current through load, no current through rest of secondary-side components, little current through primary winding. Capacitor C1 fails shorted: increased current through both transformer windings, increased current through diodes, increased current through inductor, little voltage across or current through load, capacitor and all diodes will likely get hot. When you open the case of this power supply, you immediately notice the strong odor of burnt components. From this information, determine some likely component faults and explain your reasoning. Shorted capacitor, open transformer winding (as a result of overloading), shorted diode(s) resulting in blown fuse. Remind your students that test instrument readings are not the only viable source of diagnostic data! Burnt electronic components usually produce a strong and easily-recognized odor, always indicative of overheating. It is important to keep in mind that often the burnt component is not the original source of trouble, but may be a casualty of some other component fault. The ripple frequency of a half-wave rectifier circuit powered by 60 Hz AC is measured to be 60 Hz. The ripple frequency of a full-wave rectifier circuit powered by the exact same 60 Hz AC line voltage is measured to be 120 Hz. Explain why the ripple frequency of the full-wave rectifier is twice that of the half-wave rectifier. There are double the number of pulses in the full-wave rectifier's output, meaning the wave-shape repeats itself twice as often. I have heard students concoct very interesting (and wrong) explanations for why the two frequencies differ. One common misconception is that is has something to do with the transformer, as though a transformer had the ability to step frequency up and down just as easily as voltage or current! If students are not understanding why there is a frequency difference, you might want to help them out by asking two students to come up to the front of the class and draw two waveforms: half-wave and full-wave, along with their original AC (unrectified) waveforms. Ask your students to explain how they solved for this output voltage, step by step. Explain why this is. How can the addition of nothing but a capacitor have such a great effect on the amount of DC voltage output by the circuit? The filter capacitor captures the peak voltage level of each pulse from the rectifier circuit, holding that peak level during the time between pulses. Many new students find this phenomenon paradoxical, especially when they see a DC output voltage greater than the AC (RMS) output voltage of the transformer's secondary winding. Case in point: being able to build a 30 volt DC power supply using a transformer with a secondary voltage rating of only 24 volts. The purpose of this question is to get students to face this paradox if they have not recognized and resolved it already. The technician measures approximately 18 volts AC (RMS) across the secondary winding of the transformer. Based on this voltage measurement and the knowledge that there is reduced DC output voltage, identify two possible faults that could account for the problem and all measured values in this circuit, and also identify two circuit elements that could not possibly be to blame (i.e. two things that you know must be functioning properly, no matter what else may be faulted). The circuit elements you identify as either possibly faulted or properly functioning can be wires, traces, and connections as well as components. Be as specific as you can in your answers, identifying both the circuit element and the type of fault. I'll let you and your classmates figure out some possibilities here! The technician measures 120 volts AC between test points TP1 and TP3. Based on this voltage measurement and the knowledge that there is zero DC output voltage, identify two possible faults that could account for the problem and all measured values in this circuit, and also identify two circuit elements that could not possibly be to blame (i.e. two things that you know must be functioning properly, no matter what else may be faulted). The circuit elements you identify as either possibly faulted or properly functioning can be wires, traces, and connections as well as components. Be as specific as you can in your answers, identifying both the circuit element and the type of fault. If this EMI/RFI filter does nothing to or with the line power, what purpose does it serve? An EMI/RFI filter has no purpose in the process of converting AC power into DC power. It does, however, help prevent the power supply circuitry from interfering with other equipment energized by the same AC line power, by filtering out unwanted high-frequency noise generated within the power supply by diode switching. Follow-up question: calculate the total inductive reactance posed by the two inductors to 60 Hz power if the inductance of each is 100 mH. These filters are very common in switch-mode power supplies, but they are not out of place in linear ("brute-force") power supply circuits such as this one. Mention to your students how the abatement of electromagnetic and radio frequency interference is a high priority in all kinds of electronic device design.